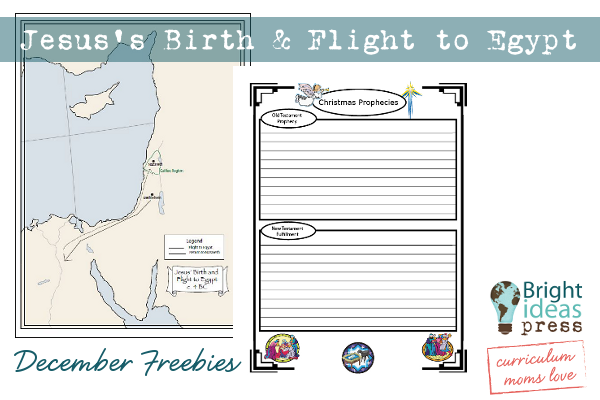 If you like to integrate seasonal celebrations into your homeschool, we have a perfect set of freebies for you this month. This lesson can be used along with The Mystery of History Vol 1, Lesson 103 Jesus Christ, His Birth. As it was foretold in the Old Testament (Hosea 11:1), the child Jesus was taken by his parents to Egypt to escape Herod’s violence (Matthew 2:14-15). 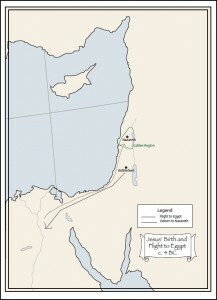 Trace Jesus’s birth and trip to and from Egypt on this full color printable. This map, created with WonderMaps, has a blank page as well as a key. Extend your lesson by learning about the many other Old Testament prophecies that were fulfilled in the Christmas story. This printable notebooking page has room to copy Scriptures, write explanations, or draw images (for younger learners). 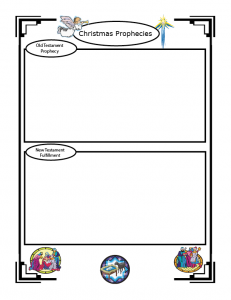 When you use these free printable Christmas notebooking pages, we would love to see them! Upload your images to our Facebook page for the Bringing Bright Ideas Home feature. Christmas is a perfect time to merge our real life celebrations with Bible and history. For more holiday homeschool ideas, see Maggie Hogan’s eBook History & Holidays. Jenn Hamrick is a long-time fan of the Hogan family and a believer in their mission of Bright Ideas Press. As a long-time homeschool mom with a background in business, Jenn serves as the Director of Marketing–providing and executing strategic plans and marketing initiatives and is a liaison between current and potential customers.